In Honor of James Bond Day, Here’s One Hell of a Decadent Martini! It’s Global James Bond Day, folks. Time for a martini if there ever was one. And in honor of Mister “Shaken-Not-Stirred,” the evil masterminds at New Orleans’ Restaurant R’evolution have devised a bank-breakingly decadent concoction known as the Vesper Martini. It’ll set you back about $100. The villain responsible for the decadent price tag is a special limited edition gin from Nolet’s. Now, whereas vodka quality tends to be about what isn’t in it, the same cannot be said of gin, where jealously guarded recipes can entail some astonishingly complex and costly aromatics. They all contain juniper and citrus, cassia and orrisroot, but beyond that, the riffs are just about endless. Nolet’s Reserve Gin contains some wild ones, including saffron, the world’s most expensive spice, and some kind of fancy-pants verbena, as well as an array of Mystery Herbs. This gin will set you back about $700 a bottle (not a typo). Because of the saffron (which comes from the stamens of a crocus blossom and is powerfully deep orange in color) this gin isn’t totally clear, but rather a slightly shimmery pale gold hue. It’s very high-proof, so it packs a bit of a sucker-punch, and it has a rounder, richer consistency than many gins, with a brooding, warm and bitter quality before the more traditional florals hit your palate. To recreate the Vesper at home, you can take out a loan for the Nolet’s Reserve, or of course substitute the gin of your choice. Go for higher complexity and dark herbaceous notes to get closer to the experience they’re serving up at R’evolution. Directions: Build in a mixing beaker. Add ice, stir gently. 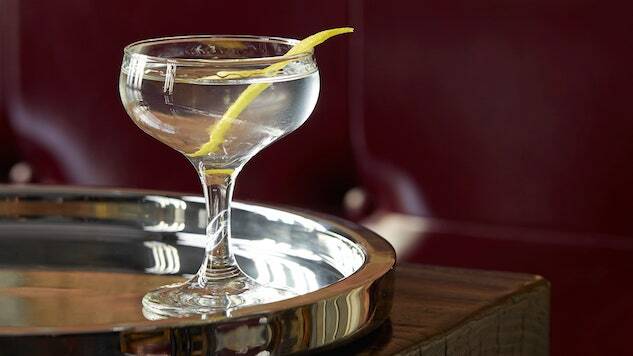 Strain into a coupe and garnish with an expressed lemon twist. And if this is all too much for you, James Bond’s other signature drink is Champagne Bollinger. Either way, Happy 007 Day!